Notes: Peveril Castle (also Castleton Castle or Peak Castle) is a ruined early medieval castle overlooking the village of Castleton in the English county of Derbyshire. It was the caput of the Honour of Peverel,  and was founded some time between the Norman Conquest of 1066 and its first recorded mention in the Domesday Survey of 1086, by William Peveril, who held lands in Nottinghamshire and Derbyshire as a tenant-in-chief of the king. Nearby Castleton benefited from the presence of the castle, which acted as the caput of the feudal barony of "Peak". The town became the economic centre of the barony. The castle provides views across the Hope Valley and Cave Dale. Peveril Castle stands sentinel on a limestone outcrop over the west end of Hope Valley, in the midst of an ancient landscape. On the north side of the valley is Mam Tor, a Bronze Age hill fort, and 2 miles (3.2 km) to the east at Brough and Shatton is the Roman fort of Navio. The valley formed a natural line of communication and had extra importance due to valuable mineral resources in the area, particularly lead. The site is cared for by English Heritage and situated in a national park. 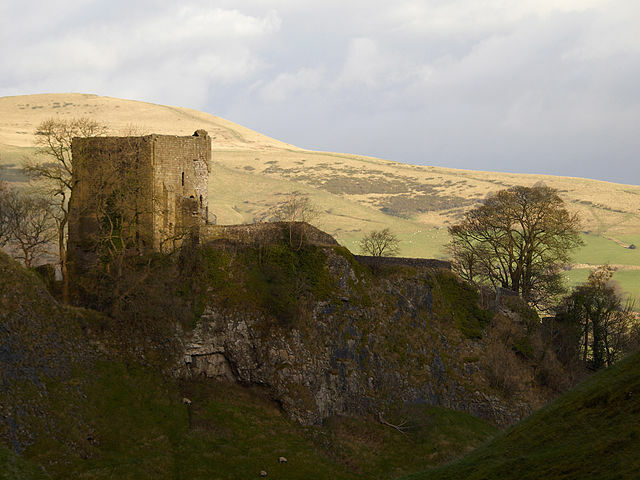 Peveril Castle is protected as a scheduled monument and a Grade I listed building.